Ful Mudammas – Learn a historical Middle Eastern recipe from ancient times made with fava beans, olive oil, onion, garlic, and cumin. Ancient Israelite cooking. For Throwback Thursday, I’m revisiting one of the first recipes I covered on my blog – Ful Mudammas. This refreshed version features beautiful new photographs by my talented friend Kelly Jaggers. I’ve always been curious about the recipes and ingredients of ancient Israel: the grains, meats, vegetables, fruits and spices that were consumed in Biblical times. This period in history has always fascinated me, especially the food—what was eaten, how it was prepared and the ways it was served. Finding out how people lived thousands of years ago is like putting together a complicated puzzle with lots of missing pieces. We rely on the research of archaeologists, historians, and the surviving texts from this period—the Talmud, Roman writings, and of course the Bible. Here, we read the Bible as a history book, gleaning clues from both the Torah and the New Testament to determine the important role food played in Biblical times. A few years ago I visited two places in Israel that offer a rare glimpse at ancient Biblical life: Nazareth Village and Neot Kedumim Biblical Landcape Reserve. Both of these locations offer a unique opportunity to experience what life was like for the ancient Israelites. At Neot Kedumim I met with Dr. Tova Dickstein, who is known worldwide as an expert on ancient and Biblical foods. She’s been interviewed by National Geographic and the History Channel, as well as the Naked Archaeologist. Tova generously shared her extensive knowledge of Biblical foods with me, which made for a fascinating afternoon. Tova gave me an educational tour of Neot Kedumim. The reserve stands above a valley where archaeologists have unearthed one of the oldest known agricultural communities. Neot Kedumim was established in the 1960’s by Noga Hareuven, a well-known biblical botanist. He wanted to create an educational park where the landscape would reflect the physical setting of the Bible. The plants, trees and crops that grow there reflect the flora of ancient Israel. 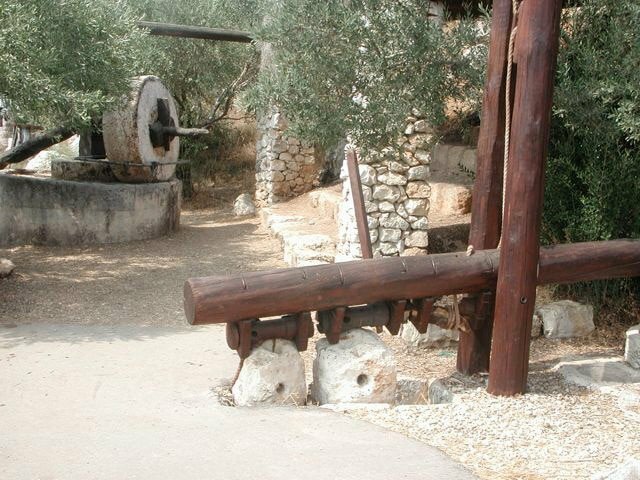 After the park was established, archaeologists discovered some incredible things at Neot Kedumim, including ancient wine and olive oil presses. The park also contains reconstructed wheat threshing floors, water cisterns, and ritual baths. At one point during our interview, I asked Tova what the main protein source was for the ancient Israelites. She explained to me that meat was rarely consumed because it was too expensive for the majority of ancient Israelites; it was considered a “luxury” and was eaten sparingly. They ate a largely vegetarian diet that relied heavily on grains, Mediterranean vegetables, fruits, and legumes. One of most popular legumes in the Biblical diet was the “broad bean,” or what we refer to today as the fava bean. Fava beans are one of the oldest domesticated food legumes. References to fava beans occur in both the Talmud and the Mishna, indicating they have been part of the Middle Eastern diet since at least since the 4th century. During our interview, Tova told me that fava beans were likely one of the main protein sources for the ancient Israelites. In fact, the ancient method for cooking fava beans is discussed in the Talmud. The beans were immersed in a pot of water, sealed, then buried beneath hot coals so they could slowly cook. 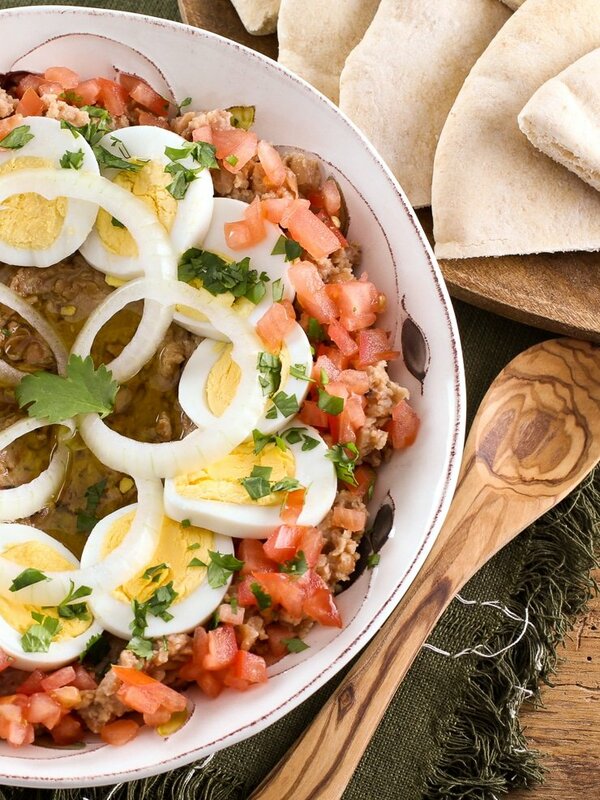 Ful mudammas is served in different ways throughout the Middle East; it is particularly popular in Egypt and Lebanon. Some countries top it with hard-boiled egg, others like it with chopped fresh tomatoes. Some serve it mashed, others leave the beans whole. The base of the dish tends to be the same everywhere, including fava beans, garlic, lemon juice and olive oil. Lemon wasn’t cultivated in Israel at the time of the Torah, though there was a similar citrus fruit called a “citron” that was sometimes used in cooking. That said, lemon juice adds a terrific flavor to ful mudammas. If you would like to keep it strictly Biblical-style, cut the lemon. The rest of the ingredients were available and common to the ancient Israelites. Ful muddamas is traditionally served for breakfast or lunch, sometimes together with hummus, alongside fresh warm pita bread. The bread is used to scoop up the fava beans. Personally I find this dish quite filling without the bread, so those of you who are gluten-free can readily enjoy this recipe too. I usually use roasted garlic in my ful, which is easier to digest than raw. Either can be used; raw garlic will have a stronger flavor in the finished dish. If cooking dried fava beans, prepare them using the instructions on my blog - How to Prepare Fava Beans. If using canned fava beans, pour them into a colander to drain. Rinse the beans in cold water. Set aside, then continue with recipe. In a large skillet, heat 1 tbsp olive oil over medium heat. Fry the diced onion till it becomes translucent and golden. Add garlic and cumin, sauté for 1 minute till fragrant. Add the fava beans to the pan, then add about ½ cup of water to the skillet. Bring mixture to a boil. Reduce heat to medium low, season with salt and pepper to taste (I usually add about ½ tsp salt and 1/8 tsp of pepper). Cover the skillet. Let mixture simmer for about 10 minutes on medium low heat until the beans are nice and tender. 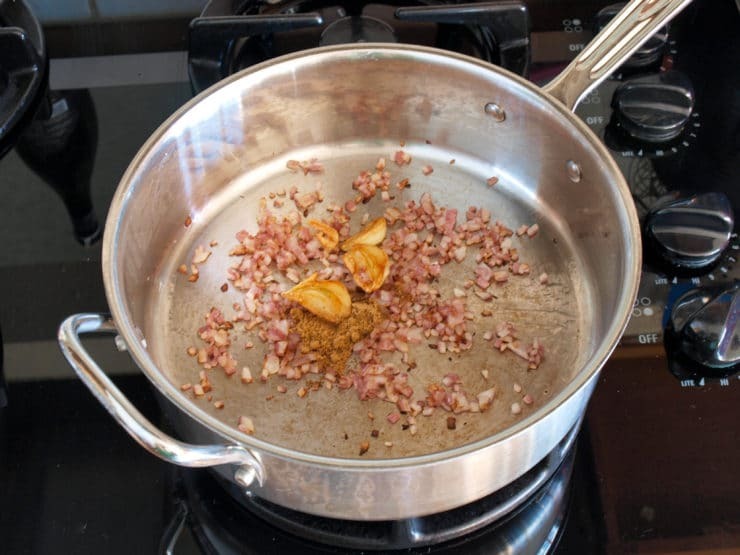 Remove lid from pot and continue to cook until the liquid has reduced by about 75 percent. Remove from heat. Pour the fava bean mixture into a mixing bowl. Squeeze in the fresh lemon juice. Mash the mixture to a semi-smooth consistency; it should be a little more chunky than hummus. For a mashing tool, I like to use my spice pestle. You can also use a potato masher or the back of a large metal spoon. Serve each portion on a plate as you would hummus. Create a shallow basin in the center of the ful mudammas. Drizzle olive oil lightly inside the basin, then garnish with the ingredients of your choice. Serve hot. I discovered Ful Madammas about 4 years ago as an expat in West Africa and ate is regularly for lunch with flat or pita bread. It’s great for a hearty breakfast paired with scrambled eggs. Yes we eat this in Egypt too as well. I am an American Muslim Revert who now lives in Egypt. What if I have access to fresh favas? I often use them in salads. I pluck the beans from the pod, blanch for 30 seconds or so and then peel off the shell. They are bright green. Could I use them to make this dish? Just cook them until they are soft and tender? Instead of using fava beans, I use Azuki/Adzuki/Choli beans, bought at an Indian supply store, which are smaller and more flavorful. After soaking the beans, I put in a small amount of chopped onion and cumin in the pressure cooker with the beans ( once I put in dried Italian spices). When the beans have finished cooking, I pour off the ‘broth’, retaining about ½ cup, and then add the salt, pepper, ½ minced raw onion, garlic, cumin, EVOO, sesame oil (instead of tahini) and lemon juice. I realize it may not be authentic Ful, but definitely a nice flavorful twist to the dish, which I eat for breakfast and lunch. Great recipe Tori, I haven’t had Foooool for a long time but I will now. Well overdue, I also leave the beans whole. Slow Cookers nowadays do a great job.???? Wonderful historic information and details about the ful! My Lebanese friend taught me how to prepare this dish as her mother did. She used chopped parsley but I also add chopped cilantro which gives it great flavor. Instead of mashing, I use the beans whole which has turned this dish into a favorite one for both my husband and brother! Thank you for all the options!! I LOVE this recipe. It’s so easy and quick, and sooo delicious. I use a lemon and half however so that the lemon doesn’t take over the taste. A local restaurant serves a fava bean side dish, but it is cold. It tastes like it has garlic, lemon and definitely onions, not cooked. I have looked everywhere for a recipe. This is the closest I have found, but it says serve warm and the onions are cooked. Any thoughts? In Egypt, this dish is served warm only. In Egypt, ful is eaten warm but also makes great cold sandwiches. Onion and garlic are not cooked, instead a little garlic is mashed and used raw in the ful. Onions are served on the side raw (to be eaten like you would a pickle next to the meal). Also a lot less lemon is used than indicated above. Limes are preferred. 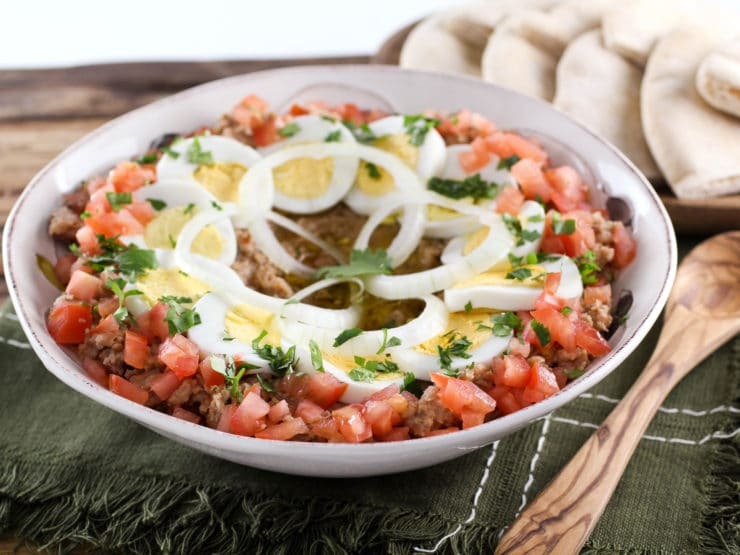 If you are looking for recipes, head to your nearest coptic orthodox church on a Sunday morning where many there can provide their own personal takes on this dish. Made this last week. Tastes like my childhood. Loved it. 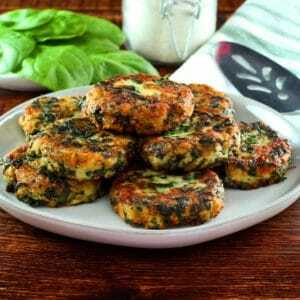 My family loved this for dinner tonight along with a quinoa salad and a green salad. My husband loved the egg garnish. I used dried fava beans, fresh garlic, onions, mint and tomatoes. One of the garnishes was garlic hummus. I had forgotten to drizzle the olive oil. I’m Egyptian and this is our street food and the national dish. Our version of fish & chips is “ful and falafel”. You need to soak the beans for a few hours and then cook them overnight on a very faint flame. They are traditionally cooked in a special pot “the dammasa” (i.e. where the mudammes is cooked). A typical Egyptian grannie would put her dammasa on the stove on very low heat before she goes to bed so that the ful is ready, tender and ready for breakfast. Oh my gosh. This was so incredibly good. I used just canned fava beans, but otherwise, just followed the simple recipe and arranged our plates like the picture. The little puddle of EVOO in the middle really adds a nice touch. I make fava bean salad out of the can. Drain but don’t rinse. Serve with warm Arab btrad. Also with babaghanouz if you like. A very good and healthy lunch! 1. 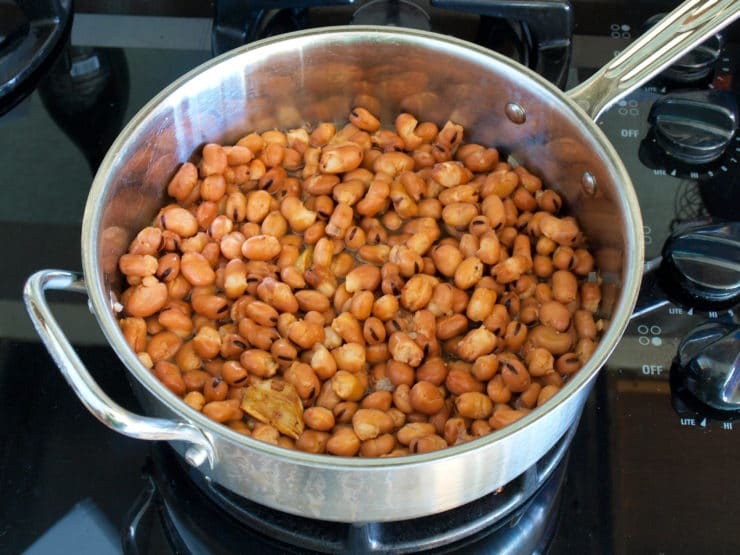 In a pressure cooker – in which case it will cook very quickly BUT the skin will separate from the beans. 2. Cook as you would normally in a pot, and when they’ve reached the stage when they don’t seem to be getting any more tender, add some baking soda (the water will froth so take care it doesn’t spill over.) The beans will soften considerably. In fact, you can add soda to the beans in the pressure cooker method too. These methods will work for all beans (fresh or dried), whole and split lentils and daals, and dried peas and legumes. Cooking times will obviously vary depending on what is being cooked. This was absolutely electric, and all of the ingredients came from my backyard! 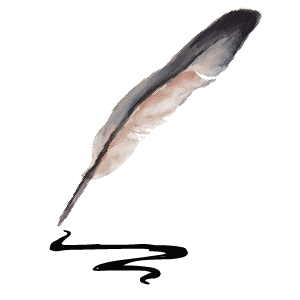 Great writing too–I really enjoy the history of food. Thanks! thought you might like my experience with your recipe The first time I cooked this for my vegan daughter and son-in-law, I goofed the recipe and added the lemon when I added the water! I then reduced in a lemon water mixture. needless to say, it came out lemony, but delicious. if your a lemon flavor fan, you might want to try this!! thanks again for posting. Whole family loves it–hot or cold. we serve with some tahini, pita bread and Israeli salad on the side. Yum!! I had heard about fava beans but had never seen them, so when I finally saw them in the store I had to buy them even though I had never tasted or cooked them before. I am so happy that I found your throwback Thursday post ! I added the following toppings tomatoes, tahini and spinach and served it over brown rice and love, love, loved it !!! Thanks so much for sharing the cultural information and the recipie. I will be making this one again for sure !!! The trick to making the beans softer is to put some baking soda in the beans while cooking them. 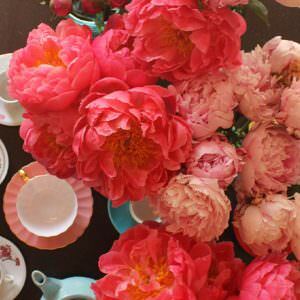 I’ve made Ful many times and there is one hint I’d like to pass on. 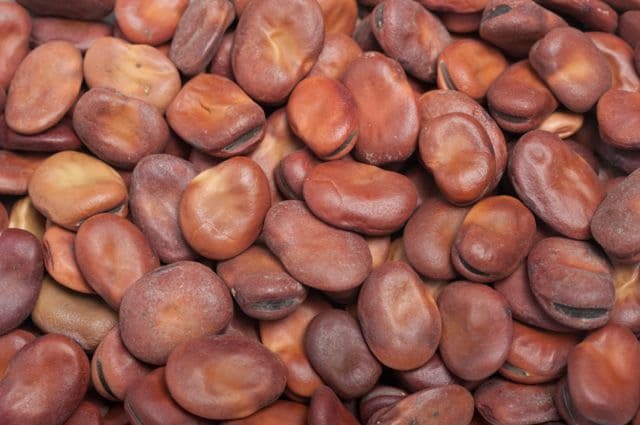 If you’re doing it with dried beans, usually the dried beans you see in the US are large Ful Medammes, BUT in Egypt (where I grew up) the beans they use (and the ones in the cans) are Ful Hammam, a slightly smaller, more tender version. This makes a huge difference when cooking! I’ve found that if you use the large beans, only cooking in a pressure cooker and then shelling the beans (removing the tough outer skin) will yield a passable result. 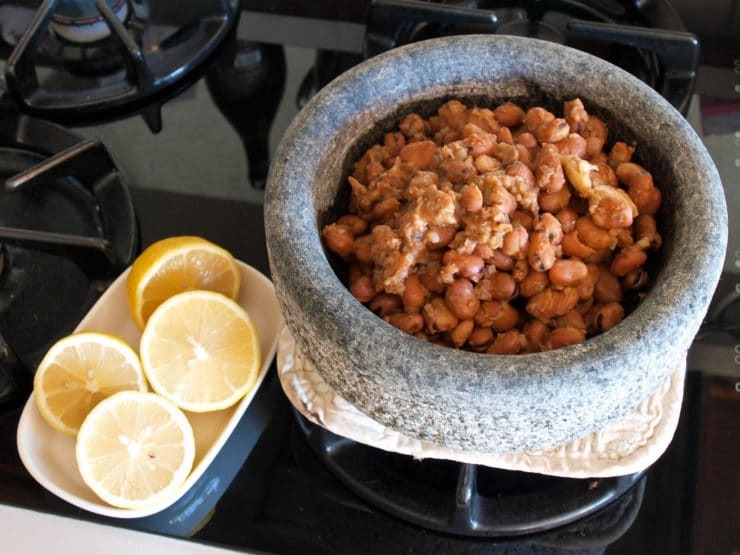 Or using an Egyptian bean pot and burying it under coals over night. If you use the smaller beans, you don’t have to use a pressure cooker or shell the beans afterwards. Yet another reason to just go with the canned beans! 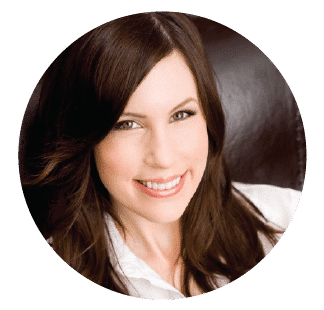 Great tips Crystal, thank you for sharing! Have you gone all the way through a post about ful without mentioning that it’s an Arab and not Israeli dish? For shame. Ful is as much a part of Israel’s food history (it’s referenced in the Jewish Talmud) as the Arab countries that surround it. This post is about Biblical food history; ful is simply one example of a dish that might have been eaten in Biblical times. The most ancient references to ful are Egyptian, and indeed an entire post could be written about the history of this dish alone. The focus of this post was not the history of ful mudammas– my intent was to discuss cooking during Biblical times. On another note, if your comment is made simply in the spirit of being anti-Israel (as I suspect it may be, considering you failed to read the whole post before commenting), please let me know so I can be sure to block you from my website– that way you can never be offended by my posts again. Superb. Going to share it on my FB to let me Indian friends know about an interesting and favorfull recipe. This is v similar to our Chana masala from India. Normally it is eaten with Batura or fried Indian bread. I was wondering, after soaking the fava beans overnight, would it be possible to put in a crock pot on high and cook them all day, then have this delectible dish for dinner that evening? You can try putting in a tablespoon of baking soda to break down the skin of the bean. This looks and sounds amazing, will have to try it soon. Look’s like it’s healthy. !!! Hi Tori, thanks for taking us to two places in Israel that offer a rare glimpse at ancient Biblical life. I enjoyed very much the tour with you !! You looked gorgeous and outstanding with the people there !! My sister told me that in Shanghai, China, fava beans are in season — in May, fresh !! I sent your website to her so that she can cook it for her family. Thanks for sharing all the yummy recipes and taking us the details of many recipes. Have a great weekends and Happy Sabbath day !! Looks delicious! I’ve never had fava beans, although I’ve honestly never met a bean I didn’t like. This would make a fantastic brunch dish. I really like the idea of serving it over hummus. At first glance, I thought it had shrimp in it — I think the tomatoes fooled me. After reading the recipe, it occurs to me that shrimp might be really tasty as a garnish, along with the eggs & tomatoes. Obviously, that wouldn’t be kosher, but delicious nonetheless. I grew up with parents and grandparents from Egypt We ate this as a soup. My mom would also use brown eggs in there and it was delish! Have you ever heard or tastes (excuse the spelling) Mullicaya it’s a green soup I would love to make it! I had molokhia tonight for dinner with rice and chicken served as a soup. Delicious. When I lived in Jordan, my favorite breakfast was hubuz, oil, and zahtar….yummmmm. What please, is hubuz? I was introduced to Middle Eastern Food in the 70s, from my daughter’s step-mother (Syrian). Nina we love it with eggs! That is my favorite dish since I was a kid, Best breakfast dish ever ! I never get excited about ful, but that looks way more interesting than the stuff I got to eat. Basically, beans and bread. you can also crumble some fetta cheese and some flafel on top of ful muddamas and add some chopped fresh parsley and mint leaves then just add alittle olive oil and enjoy!. Hey Tori! I just love your website. I was wondering if you had any information on what people used to eat for breakfast in history? I used to live in South Korea and they don’t really have “breakfast” foods or dishes like Westerners do. Have Westerners always eaten particular foods for breakfast or are cereal and pancakes and items like that just part of a diet trend of the last 100 years? We do this recipe in Malta and it is called “Bigilla” A traditional and ancient recipe. The beans are soaked overnight. They are then placed in a large pot and covered with water and left to simmer until they are cooked and the liquid is absorbed. The beans are mashed and then placed in a bowl, chili pepper and garlic are added according to taste, and garnished with fresh chopped parsley. Just before serving we sprinkle some olive oil. This dish can be served hot or cold with crusty bread. 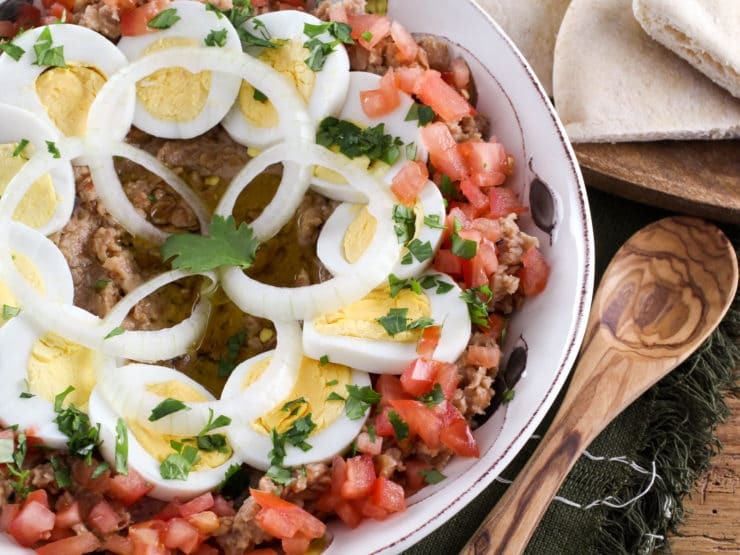 We learned this dish from a friend who grew up in Egypt. He uses fava beans and lentils interchangeably; we use lentils ourselves because they go so fast from dried to cooked (I don’t eat canned food), and because we like the nuttier taste. We’ve always served it with tomatoes and scallions, as our friend does. Excited to contemplate hard-boiled eggs! Melvin I do not recommend serving this dish cold, it is really best served warm (in my opinion). Really impressive! I was thrilled to try such a carefully researched recipe and was not disappointed. We made it today and it was amazing. My ful muddamus always tasted sort of Indian in the past (we are Indian-Americans) and it’s great to try a recipe for it that makes it taste truly middle eastern. Hooray for authentic cooking! So happy you enjoyed it Sangeeta! Thank you for posting this! There’s a Greek and Arabic restaurant opposite my college, and the ful mudammas that they serve has become my favourite lunchtime dish. It’s great to find a recipe for it that I can make at home too! I will be making this along with flatbread and Basaboosa for my Preschool class. This month we learned all about Egypt. Thank you!! I love that the kids will be eating this as part of their exploration of Egypt! So neat! Mmmm ful!! We spell it “foul” which is funny cuz we don’t pronounce it “foul” more like “fool.” We usually make it with hummus and serve the two together. Healthy and DELISH. Never tried roasing the garlic, I will try that next time! I love these vegetarian GF recipes, they’re so hard to find! Glad I discovered your site. We used to eat this at a Lebanese restaurant in my neighborhood but they closed down a few years ago.Ate it in the morning,then we didn’t need to eat the rest of the day. Thank you, I’ll ask my wife to make it for us. Shiksa! I am so excited about this recipe and the idea of more. I have wanted to learn about Biblical foods, etc for some time now. I want to know exactly how our biblical ancestors lived. I can’t wait for your cookbook to be printed. Have a blessed evening my friend. It looks delicious! Btw do you have a recipe for gluten-free pita bread? I’m really missing pita bread. By the way, where can I find fava beans? Thanks Tori! Thea, I don’t have a GF pita recipe unfortunately, but I bet you can find one on the web. You can find fava beans at your local Middle Eastern market, and sometimes at the health food store. Some major grocery chains carry them in the dry bean section. I just saw gf wraps at Walmart yesterday in/near the Hispanic section.